Home > Seafood Appetizers > Crab Cakes, Lobster Cakes & More! > Classic Baked Stuffed Flounder! 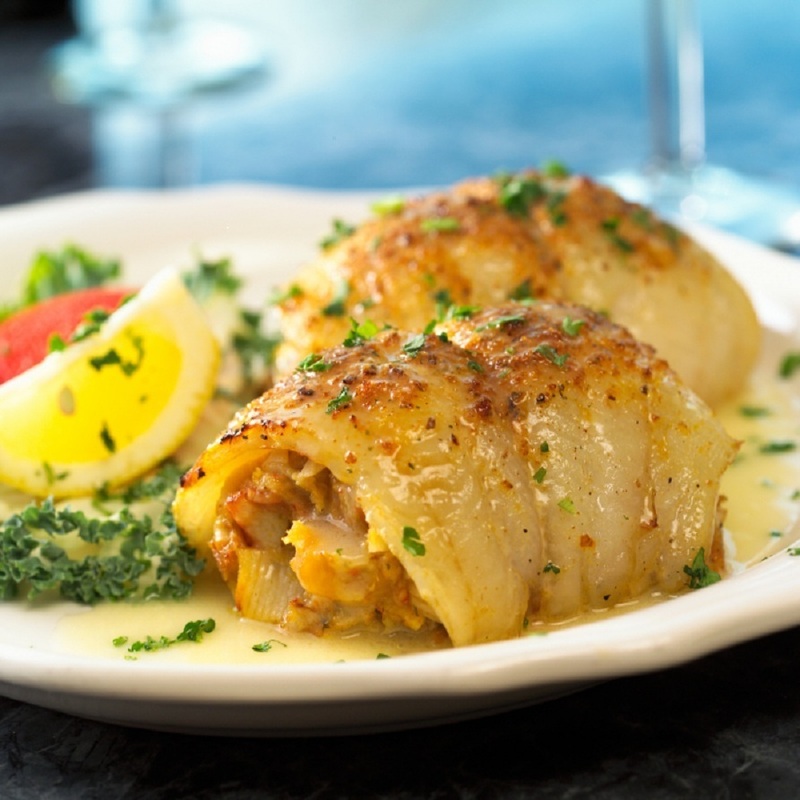 Our Classic Seafood Stuffed Sole is A Down East Favorite! Made with Locally caught Dayboat Flounder Fillets, Rolled around Capt. Tim's own Seafood Stuffing with Tender Sweet Bay Scallops inside the stuffing! It's Easy to Prepare, And Even Easier To Enjoy! P.S.... This is one of Capt. Timmy's Favorites! Seafood Entrees • Atlantic Salmon Fillets • Baked Stuffed Jumbo Shrimp! • Hand Cut Swordfish Steaks! Our Stuffed Sole Is Prepared With Local Atlantic Yellowtail Flounder And Stuffed with An Incredible Seafood Stuffing And Tender Bay Scallops! 4ct. Stuffed Flounder per order. A Great Gift Idea, for Holidays, Anniversary Dinners, Birthdays or A Great Corporate Gift Idea!! Order Your Stuffed Flounder By 10am EST, And Enjoy Them It For Dinner Tomorrow! Our Seafood Entrees Also Make Great Gift Ideas For Your Favorite Seafood Lover! How Easy Is That! Stuffed flounder was very very good! We enjoyed it, Carol R.
Very good Choice! We made a nice sauce fro it and baked it. Loved the scallops inside of it too! This is not easy to find outside of New England. It is as good if not better than what I remember finding in good restaurants around New England! Stuffing was better than I remember to be honest! We ordered for Thanksgiving and we were not dissapointed! everything was great, and the stuffed flounder was excellent! We baked ours with lemon and butter and it was wonderful! You can't get quality sefood like this everywhere, but we now know who to call for it! We figured to try this it looked so good. It was excellent, and the scallops inside that magnificent stuffing was a bonus! We are hooked! This stuffed flounder Is really really Good Stuff! My wife ordered it, and served it with a nice cream sauce she made up on top of it. A plate licker for sure!